Gain Mobility with a Power Wheelchair! Each year thousands of Americans find themselves affected by disease or disability which causes them muscle weakness, pain, balance disorder, poor endurance and shortness of breath and ultimately puts them at risk of falling. Many people have found a way to regain their mobility with a power wheelchair. If you or someone you love suffers from limited mobility or a risk of falling, a power wheelchair from Open-Aire Mobility Division can greatly aid with a return to activity, comfort, and happiness. for the most stable unit in its class! 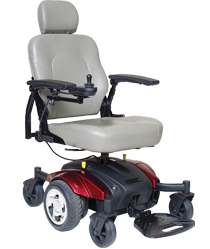 Open-Aire Mobility Division offers a wide variety of power chairs including travel, standard and bariatric models. Take a moment to click on the pictures below to see our full product line including our power chairs, scooters, and lifts.